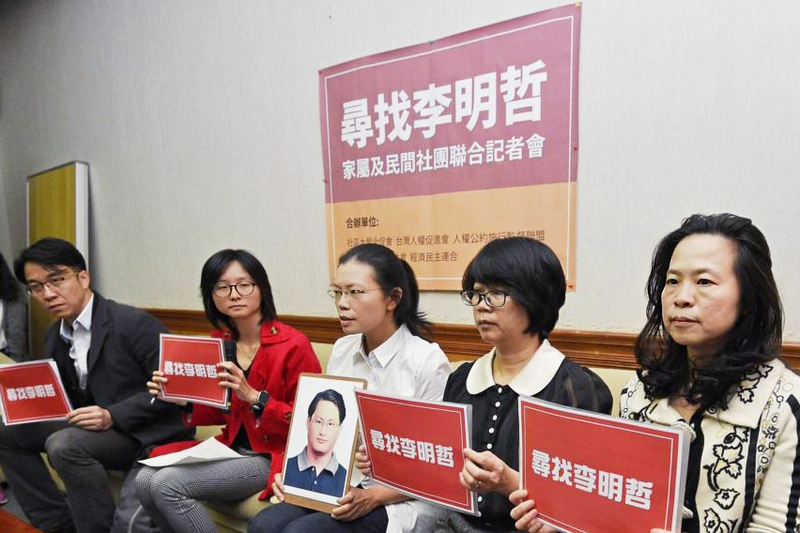 Lee Ching-yu (center), the wife of Taiwanese human rights activist Lee Ming-che, holds a portrait of her husband at a press conference asking the People’s Republic of China to release Lee Ming-che from custody, March 24, 2017. This piece was first published on the NYR Daily on August 16, 2017. On March 19, a human rights activist from Taiwan named Lee Ming-che disappeared in mainland China, and his wife back in Taipei, Lee Ching-yu, became a member of one of the least desirable clubs in the world: the spouses of people who for political reasons have fallen into the hands of China’s public security police. The club’s members share at least two characteristics. One, they have been deprived of husbands or wives who have done nothing that would constitute a crime in any democratic country; and two, they face a kind of deafening silence from the authorities in China, and that silence itself speaks loudly of the power that the state has over the puny, isolated individual—in other words, over Ms. Lee and her like. In normal times, China and Taiwan, the self-governing island that Beijing claims as its territory, are in regular contact, carried out by agencies authorized by each side to negotiate with the other. But ever since the election last year of Taiwan’s current president, Tsai Ing-wen, who favors a separate identity for Taiwan, China has suspended these contacts, which meant that the Taiwan authorities were unable to make inquiries on the Lees’ behalf with their mainland counterparts. Instead, Ms. Lee called the police in the city of Zhuhai on the Chinese side of the border between Macau and Guangdong province where, she knew, her husband had planned to cross. The police told her that Lee had indeed entered Zhuhai that day, but they had no other information. On March 24, five days after the phone call that didn’t come, Ms. Lee held a press conference in Taipei to announce that her husband had gone missing, and to call on the Chinese authorities to reveal what had happened to him. Her appearance was big news in Taiwan, where people seem immediately to have viewed Ms. Lee as a very sympathetic figure, and not just because her husband has been imprisoned for no justifiable reason. Lee Ching-yu, a slender woman in her early 40s, is soft-spoken, intelligent, a touch formal; she has a kind of steely grace about her, and speaks with a sad dignity that I noticed right away when I met her in Taiwan. Despite her absolute lack of power, she’s been an effective organizer of what has become an international campaign on behalf of her husband, and an eloquent critic of China. For five more days, there was no response to her plea for information from the mainland, and then, finally, on March 29, 10 days after Lee went missing, the Chinese authorities let it be known at a regular press briefing that they were holding him while he was investigated for “harming national security.” This was bad, but not unexpected news, and at least Ms. Lee now knew for certain that her husband was in custody. Under Chinese law, a suspect must be formally charged within 37 days of his arrest, though that time can be extended to six months in cases of national security. Sixty-eight days after he was detained, formal charges were announced against Lee—“establishing an illegal organization and planning and implementing activities to subvert state power.” Exactly what activities constituted subverting state power the Chinese didn’t say. Nor did they provide any clues as to the evidence they had gathered against Lee, or where he was being held, or when he might come to trial, or if he had a lawyer, or whether he was receiving medical treatment (he takes medication for high blood pressure), or if his wife could see him. The announcement of this particular charge was devastating for Ms. Lee and for her husband’s other supporters. Subverting state power is the sort of catch-all offense by which the Chinese security authorities can, and do, imprison people for activities that, as Ms. Lee herself put it to me, would be legal in “all democratic, civilized countries.” It is the charge that has been used against the dozens of human rights lawyers who have been locked up in China in recent years. It was also the charge under which the country’s most famous dissident, the Nobel Peace Prize laureate Liu Xiaobo, who recently died of liver cancer, was given an 11-year prison sentence. Mr. Lee in this sense is like other political prisoners in China, a man stripped of rights, facing in solitary fashion the organized power of the Chinese state, but he is also different because he is from Taiwan. He is in fact the only Taiwanese ever to be charged with subversion of state power, and this imparts a special meaning to his case. As it happens, Ching-yu, his wife, is an authority on what’s called the “White Terror,” the brutal, martial-law repression of dissent that took place on Taiwan from roughly 1947 to the 1980s, by which the ruling Nationalist Party, or Guomindang, attempted to crush the agitation for greater freedom that was being carried out by young Taiwanese, agitation that was essential in Taiwan’s eventual transformation into the multiparty democracy it is today. For the past 15 years, Ms. Lee has worked for the Shih Ming-teh Foundation in Taipei, named for a prominent, formerly imprisoned Taiwanese dissident—he spent roughly 25 years in custody—which has published documentary collections on the White Terror as well as photographic histories of the eventually successful pro-democracy movement. Given the lack of information from the mainland, it can’t be said for sure that Lee’s previous dissemination of this information was the reason for his arrest. Over the years he’d also helped raise money for the families of some of the human rights lawyers jailed in China. But it’s hard to imagine that his exchanges on Taiwan’s democracy over the years played no part in the authorities’ move against him. Given the intensifying repression in China that has characterized the regime of President Xi Jinping, publicizing Taiwan’s political evolution, suggesting it as a model for China, and presenting formerly imprisoned dissidents as heroes, seems to have been beyond what the mainland authorities were willing to tolerate. Mr. Lee in this sense emerges as a kind of latter-day incarnation of the democracy activists on Taiwan who were locked up decades ago. It’s as though he is being forced to reenact the very histories that his wife has studied and whose examples he went to China to publicize, while Ching-yu is having the experience of Taiwanese spouses of decades past, confronting the Kafkaesque world of a husband’s imprisonment by a secretive, unaccountable, all-powerful police. The Shih Ming-teh Foundation is in a white-painted brick house on the western edge of Taipei. Ms. Lee met me in a large room there with peeling green paint adorned by a wall-sized photograph of an iconic moment in Taiwan’s history. It shows what were called the Kaohsiung Eight, the main leaders of Taiwan’s then democratic opposition who were sentenced to prison terms ranging from 12 years to life following a violent confrontation with police on December 10, 1979. Among those pictured, for example, is Lu Hsiu-lien, known as Annette, a graduate of Harvard Law School who served nearly six years of a 12-year sentence, and, after Taiwan began having democratic elections, served as the country’s vice-president. “Of course I worry about my husband,” Ms. Lee told me. “I have my emotions. I feel very sad.” She pointed to one of the collections of secret police files that she’s extracted from the Taiwan archives and that the Shih Ming-teh Foundation has published. “If I didn’t have these, I wouldn’t have the strength to go on,” she told me. I noted her eyes clouding over as she said this. “Because these people walked on the edge of death. They faced danger and dictatorship.” She meant the people whose stories her husband was carrying to China. After China acknowledged that it had detained her husband, she announced that she would go to Beijing in an effort to find him. Not long after that she got a text message from a person she didn’t know who told her he had a letter from her husband and wanted to meet with her, which she reluctantly agreed to do. She continued with her plans to go to Beijing, where, had she succeeded, she would undoubtedly have received exactly the sort of international press coverage that China wanted to avoid. But on April 10, as she was in a taxi on her way to the Taipei airport, a local reporter called to tell her that her travel permit for China—required of visitors from Taiwan, and which she had from an earlier tourist visit—had been revoked. She went to the airline counter anyway, and was indeed informed that she would not be traveling. China’s ban meant, of course, that Beijing was refusing to extend to a wife the simple kindness of visiting a husband who, though imprisoned, has not yet been tried or formally convicted of a crime. This refusal was, in addition, a blatant violation of an obligation Beijing made in 2009, when China and Taiwan formally signed what’s called the Cross-Straits Joint Crime-Fighting and Judicial Mutual Assistance Agreement. In it, each side pledged “promptly to inform the other side of persons having their personal liberty restricted . . . and to provide facilitation for visits with family members.” China was ignoring both of these provisions, which made an extremely bad impression on Taiwan, where it was taken as evidence that China cannot be counted on to fulfill any assurances it might make in its ongoing effort to persuade the island of the benefits of rejoining “the motherland.” “It’s unthinkable to disappear somebody, not to inform his family, to hold him incommunicado, and to block his spouse from seeing him—this is not respected in the civilized world,” Chen Yu-jie, a Taiwanese researcher on Chinese law, told me. But while the outrage on Taiwan is unmistakable, Taiwan and Ms. Lee appear to have few means to make China pay a price for continuing to hold Lee Ming-che. She, and the others who have publicized the case, have succeeded in drawing some high-level attention to it. The United Nations Human Rights Council’s Working Group on Enforced or Involuntary Disappearances has opened an investigation—though this is unlikely to lead to anything because China no doubt will refuse to cooperate. The European Parliament has formally petitioned the Chinese government to release Mr. Lee, a plea similar to those made regarding Liu Xiaobo, and which China similarly ignored. In May, in a rather remarkable event that got very little press coverage, Ms. Lee traveled to Washington, D.C. in the company of three other members of the club of wives of husbands disappeared in China—three women from the mainland who are all wives of human rights lawyers arrested during China’s ongoing crackdown. All four women testified before the House Subcommittee on Global Human Rights. “I stand alone before you today to plead for your help for my husband,” Lee Ching-yu said. During her visit she met with Matthew Pottinger, the National Security Council director for Asian affairs, who, in 2004, while a reporter for The Wall Street Journal, was detained in a village where he was investigating charges of corruption against local officials. But there is no indication that the Trump administration has any intention of making an issue of the Lee case. What is likely to happen? There are several theories currently in Taiwan. One is that, after a certain interval, Lee will be released, though he will probably have to make a televised confession of crimes, which will obviously be done under duress and no reasonable person will think was authentic. But the grave charge of subversion of state power suggests a harsher possibility: that there will be a trial, which Ms. Lee will be banned from attending; and that her husband will be convicted by China’s compliant judiciary and sentenced to a lengthy term in prison. A third possibility is that China will convey a message to President Tsai to the effect that if she affirms the one-China principle, Mr. Lee will be allowed to go home; Tsai is showing no signs that she would be willing to accept that condition, if it were to be offered. Ms. Lee has no way of knowing which of these outcomes is more likely, and that painful uncertainty is one of the techniques deployed by the dictatorial state to intimidate its opponents. It’s part and parcel of the intentional opaqueness of a dictatorship’s procedures, providing a sort of terrifying flexibility to make the law and the truth whatever the authorities say it is. Ms. Lee knows this. The terrible, unanswerable question that she and her absent husband face is to what extent the very history she has studied on Taiwan will now be replicated by him in China. On Taiwan now, formerly imprisoned dissidents like Shi Ming-teh have been freed and vindicated. It would require a very steady sort of optimism to think that. Reporting for this story was supported by the Pulitzer Center on Crisis Reporting.